Three police officers were acquitted of all charges related to the shooting death of Sean Bell. Click here to see murder scene photos and listen to 911 tapes. Inside the courtroom, spectators gasped. Sean Bell's fiancee immediately walked out of the room; his mother cried. Unfortunately, Sean Bell's death at the hands of police is not the only incident where the police were acquitted of wrong doings. Rodney King, Eleanor Bumpers, Abner Louima and Amadou Diallo are examples of citizens who were killed or brutalized by the police. The police officers in all of these cases were acquitted of the crimes after trial. Watch video of the Rodney King beating by police officers which later sparked the L.A. Riots in 1992. Rodney King became the reluctant symbol of police brutality in America. Unfortunately, the police acquittals in these cases have become cumulative over the years along with many people's frustration with the criminal justice system. This causes many community members to make a public outcry regarding the value of African-American lives and for community leaders to chant,"no justice...no peace." Click here to learn more about these people and their stories. Watch documentary filmmaker Michael Moore's solutions for putting an end to police brutality. He mentions African immigrant Amadou Diallo in this clip from his television show "The Awful Truth" who was gunned down by police officers in his apartment in a hail of 41 shots. Michael Moore sheds light on the fact that some cops have a hard time distinguishing a wallet from a gun. Watch "The African-American" wallet exchange episode below. The NYT reports seventeen months to the day since two bullets from a swarm of 50 fired by the police killed Sean Bell, the judge in the case, Justice Arthur J. Cooperman of State Supreme Court in Queens, ruled that the detectives were not guilty on all felony and misdemeanor counts. Click here to read the text of the verdict. 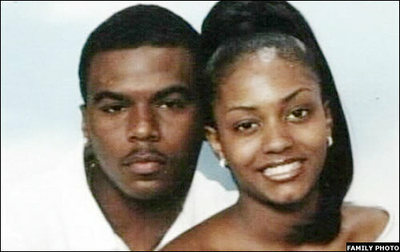 Police killed Sean Bell after a Queens bachelor party hours before he was to be married to Nicole Paultre Bell. Witnesses told of chaos, screams and a barrage of gunfire near Club Kalua at 143-08 94th Avenue in Jamaica about 4:15 a.m. after Mr. Bell and his friends walked out and got into their car. Mr. Bell drove the car half a block, turned a corner and struck a black unmarked police minivan bearing several plainclothes officers. In response, five police officers fired at least 50 rounds at the men’s car, a silver Nissan Altima; the bullets ripped into other cars and slammed through an apartment window near the shooting scene on Liverpool Street near 94th Avenue. The two wounded men, Joseph Guzman, 31, and Trent Benefield, 23, were taken to Mary Immaculate Hospital, where Mr. Guzman was listed in critical condition and Mr. Benefield in stable condition. The testimony from Mr. Benefield, 24, appeared to contradict the grand jury testimony of the detectives, none of whom have said they shot at him as he ran away. Mr. Benefield said he was first shot in both calves in the back seat. Isnora said he decided to arm himself, call for backup — "It's getting hot," he told his supervisor — and tail Bell, Guzman and Benefield as they went around the corner and got into Bell's car. He claimed that after warning the men to halt, Bell pulled away, bumped him and rammed an unmarked police van that converged on the scene with Oliver at the wheel. Benefield and Guzman testified that there were no orders. Instead, Guzman said, Isnora "appeared out of nowhere" with a gun drawn and shot him in the shoulder — the first of 16 shots to enter his body. "That's all there was — gunfire," he said. "There wasn't nothing else." Three detectives were found not guilty Friday morning on all charges in the shooting death of Sean Bell, who died in a hail of 50 police bullets outside a club in Jamaica, Queens. Justice Arthur J. Cooperman, who delivered the verdict, said many of the prosecution’s witnesses, including Mr. Bell’s friends and the two wounded victims, were simply not believable. “At times, the testimony of those witnesses just didn’t make sense,” he said. His verdict prompted several supporters of Mr. Bell to storm out of the courtroom, and screams could be heard in the hallway moments later. The three detectives — Gescard F. Isnora, Michael Oliver and Marc Cooper — were escorted out of a side doorway. Outside, a crowd gathered behind police barricades, occasionally shouting, amid a veritable sea of police officers. It was delivered in a packed courtroom and was heard by, among others, the slain man’s parents and his fiancée. The seven-week trial, which ended April 14, was heard by Justice Cooperman in State Supreme Court in Queens after the defendants waived their right to a jury, a strategy some lawyers called risky at the time. But it clearly paid off with Friday’s verdict. “The people have not proved beyond a reasonable doubt” that each defendant was not justified in shooting, he said, before quickly saying the men were not guilty of all of the eight counts, five felonies and three misdemeanors, against them. Mr. Bell’s family sat silently as Justice Cooperman spoke from the bench. Behind them, a woman was heard to ask, “Did he just say, ‘Not guilty?’ “ The three detectives — Gescard F. Isnora, Michael Oliver and Marc Cooper — were escorted out a side doorway as court adjourned. The acquittals do not necessarily mean the officers’ legal battles are over. Commissioner Raymond W. Kelly said the three men could still face disciplinary action from the Police Department, and that he had been asked to wait on any internal measures until the United States attorney’s office determines whether or not it would pursue federal charges against them. Good lord. 50 shots to a man not carrying a weapon. And there was no reason to believe that there was unwarranted deadly force. Interesting.